While we haven’t had a peak at any sales figures, as we said on last night’s PalmCast, the fact that the majority of the Palm Pre 2’s existence has been as an unlocked GSM phone, and people just don’t buy those anymore. After nearly six months on the market, HP has seen fit to cut the price of the unlocked Pre 2 in the United Kingdom from £399.00 to £370.00. To be honest, we’re having great difficulty telling if the price cut has taken hold across the Palm Eurostore, as we can’t seem to find the Pre 2 available unlocked anywhere in Europe but through the UK storefront. 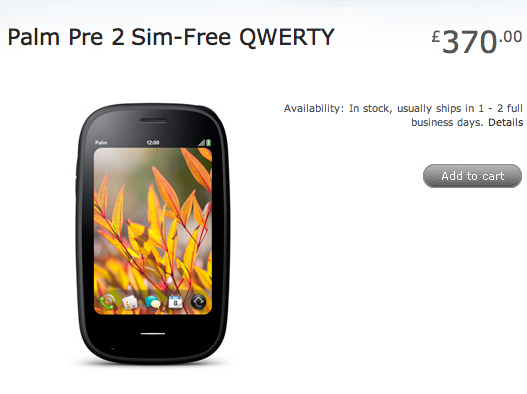 For comparison’s sake, that £370.00 translates to €422.00 (still less than before), or a whopping $594.00 American, where you can currently get the same phone for nearly $150 less.